he MxF import-label announced the release of it's second special product dedicated to 1976, entitled "Still A Legend" featuring the unreleased evening show from May 27, 1976 as recorded at the University of Indiana, Bloomington Indiana and the June 26, 1976 evening show as recorded at the Civic Center in Providence Richmond. 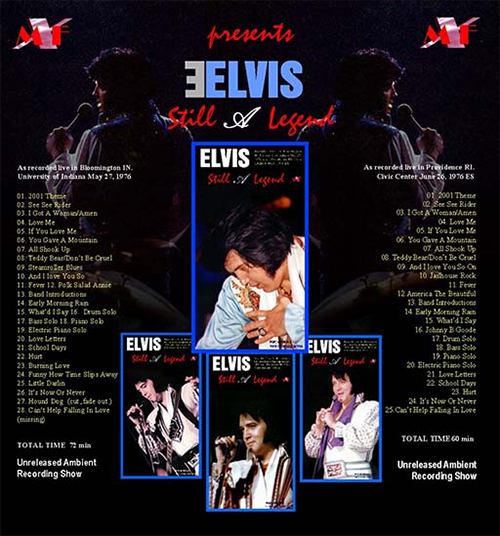 The new product respects the previous one present Elvis moving toward the third and fourth tour of the year. Carrying the weight of his problems but still unbelievable concentrate in his music as a final product to delivery to his fans ... through the tape, and maybe thanks to its limitation is possible to feel the incredible enthusiasm of the crowd ... For sure Elvis is still a legend. In the Bloomington show, Although Elvis was not looking good and In spite, the lack of renewal, in the repertoire are still included some strong numbers to make the concerts of a very good quality. Surprisingly in some of the more demanding artistically songs, Elvis builds his show, He is still able to delivery in the right way, songs like You Gave a Mountain, America the Beautiful, Burning Love, Polk Salad Annie and last single Hurt. Without a doubt, this is the focus of the show and the audience appreciated that, making the concert atmosphere still incredible experience..
Moving to Providence we are instead in the middle of the fourth 1976 tour , the show is shorter respect to the previous one (Elvis performed even an afternoon show on the same day), also the repertoire is very basic, some of the rockers like Burning Love and Polk Salad Annie have been dropped, but the show remains surprisingly well performed in all the songs… and the participation of the public is incredible. Elvis is still a legend!! This is the fourth special product for this label. This new double set will be housed in a deluxe four panel digipack, containing a 6 pages booklet with focus and details on the tour shows, including a collection of live photographs, newspapers clips plus a high quality glossy poster on 135 gram paper (50x26 cm.) and a high glossy art card on quality paper (25x13 cm). To make it a special collector item, the 400 copies will be presented with four different sleeves variations. All the copies will come hand numbered and individually sealed so there will be four deluxe editions with exclusive content. Each one limited to 100 copies. 01. 2001 Theme 02. See See Rider 03. I Got A Woman/Amen 04. Love Me 05. If You Love Me 06. You Gave A Mountain 07. All Shook Up 08. Teddy Bear/Don’t Be Cruel 09. And I love You So On 10. Jailhouse Rock 11. Fever 12.America The Beautiful 13. Band Introductions 14. Early Morning Rain 15. What’d I Say 16. Johnny B Goode 17. Drum Solo 18. Bass Solo 19. Piano Solo 20. Electric Piano Solo 21. Love Letters 22. School Days 23. Hurt 24. It’s Now Or Never 25. Can’t Help Falling In Love.